Who's afraid of over baggage fees? I sure as hell am, ever since my last trip to Japan when I found out just how much that extra kilogram of useless crap would cost me. The answer? Either a helluva lot of money, or the embarrassment of opening my luggage at the check-in gates to take stuff out. 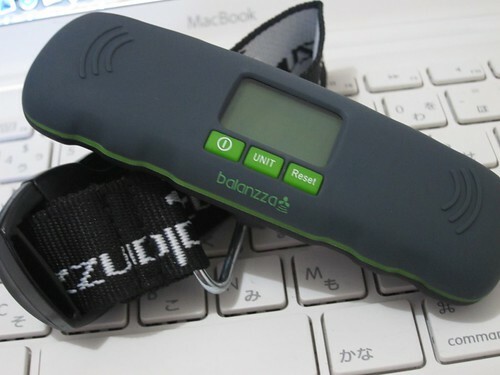 It's a Balanzza mini digital luggage scale. The brand name is borderline cheesy, but it's quite possibly the niftiest device on the planet. It has a backlit screen, it can measure in both pounds and kilograms, and it fits into all but the smallest of purses. Gone are the days of having to figure out a way to hoist the luggage onto a bathroom weighing scale without blocking the display. This comes with a strap which you secure around the bag handle. The you lift the bag using the device with one or both hands, and wait for the beep. The weight is saved after the beep so you have time to set the bag down before looking at the screen. Now the problem with nifty things is that they are often quite pricey, and this is no exception - I got mine at Travel Club for 1650PHP - but considering the embarrassment it saves you from I do think it's worth it.